This is a solid, compact machine with plenty of convenience features on offer, but its small size only makes it attractive to a limited slice of the market. Recommended for: Casual coffee drinkers and people with limited kitchen space. Purists will quickly become annoyed by this model’s lack of fine-grained controls. Are you new to the world of specialty coffee? Are you looking for a machine that can deliver plenty of specialty coffee magic with one-touch convenience that doesn’t require you to become a Barista to operate? If you answered yes to either of those questions, and you live alone or are the only coffee drinker in your home, then you’re going to love our detailed Jura A9 review. It’s a solid machine that falls short of greatness in our view, by being narrowly targeted toward a smallish slice of the specialty coffee market. Having said that, if you fit the mold of the user they designed this machine around, you’re going to love it! We’ll cover everything this model can do, and go over its various limitations, so you have all the information you need to make an informed purchasing decision. Let’s jump right in! 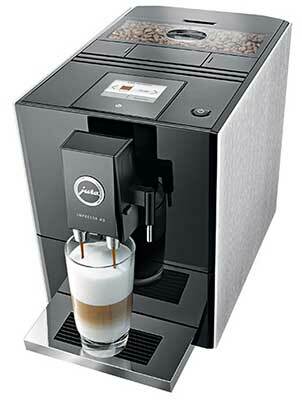 The first thing you’ll notice about the Jura A9 Automatic coffee machine is how unassuming it is. The design is simple and elegant. It’s got clean lines, so it’s not unattractive, but it seems to almost go out of its way to fade quietly into the background. The second thing you’ll notice is how small it is. While it’s not the smallest machine on the market, it falls into the compact category, with dimensions of 9.4” x 17.5” x 12.7” and weighing in at a scant 23 pounds. Even if you’re short on available kitchen counter space, it shouldn’t be a challenge to find this unit a permanent home. And, if you do have to move it now and again, it’s light enough that doing so won’t be an issue either. 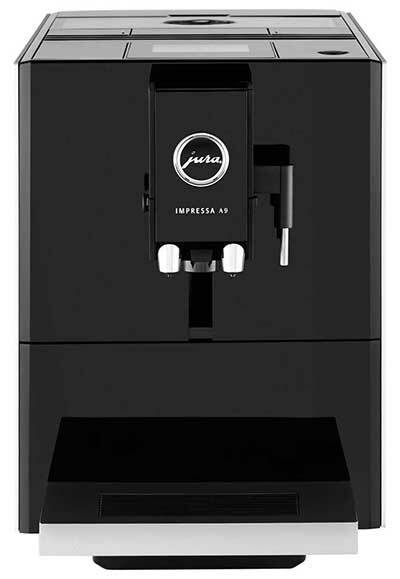 This is an important part of our Jura Impressa A9 review, and it’s a big deal to us. We’re power coffee drinkers, who consume the stuff by the gallon. In our book, the bigger the water tank, the better. Unfortunately, the Jura A9 wasn’t designed with us in mind. Its back-mounted, top-loading water tank is a scant 37 ounces in size, which left us wanting more. We’ve seen compact machines with significantly bigger reservoirs, so in our view, this was a real missed opportunity by Jura. Note that the reservoir is designed to accept a water filter, though its use is optional. The chief advantage of using the filter is that it dramatically reduces the need to descale your machine. Having said that, there are two big disadvantages. First, there’s the matter of cost. At around $25 a month, the decision to use a water filter is going to significantly increase your total cost of ownership over time. In the end, though, it comes down to a matter of personal preference. There are no “right” answers where the water filter is concerned. This was another missed opportunity in our view. While there are some things we like about the grinder, there’s one major thing we don’t. On the plus side of the equation, the A9 uses a conical burr, ceramic grinder, which is excellent, and Jura’s patented grinding technology makes it much faster than the machines offered by other companies. Unfortunately, it only offers four grind settings, which limit your flavor fine-tuning options. That’s less than the industry average of six, and we’re mystified why they didn’t at least offer that many. This is one of two main reasons why coffee purists aren’t going to like the machine. While it’s certainly fine for casual coffee drinkers and people new to the world of specialty coffee, it just doesn’t have enough settings to allow you to dial in your preferred flavor settings, and that’s a pity. The top-loading bean hopper is well paired with the water reservoir, with a 4.4-ounce capacity, but again, both are too small for our liking. Even if you live alone, if you’re a power drinker like we are, then you’re going to find yourself annoyed with the fact that you’ve got to refill the hopper and water reservoir more often than you’d like. Rounding out this feature is the one-scoop bypass doser, which is a nice touch for those times when you don’t want the whole “beans to brew” experience, or you’re just after a quick cup of decaf or using some kind of specialty ground coffee. Pro Tip: The grinders in most super automatic machines don’t like oily beans, which can cause buildups that will clog the grinding mechanism and burn out the motor. For best results, find a Medium Roast bean you enjoy and stick with that! For us, this was a deal breaker, although it won’t be for broad swaths of the specialty coffee market. 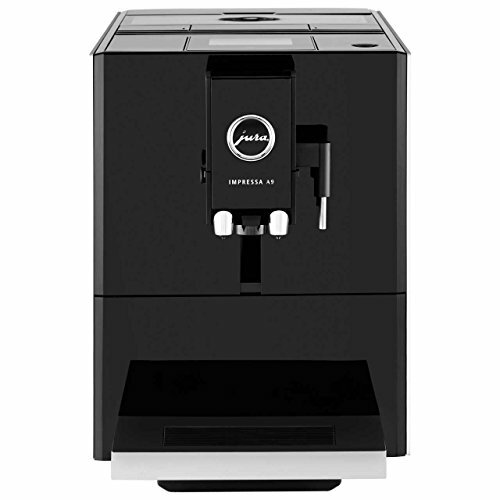 The Jura A9 coffee machine utilizes a single aluminum boiler, lined with stainless steel. That’s not bad, and since it features Thermoblock technology. It heats rapidly enough that you’re not left waiting unduly long as the machine switches from milk steaming to coffee making. But that’s not what kills this feature for us. The showstopper is the fact that there’s no way to adjust the boiler temp. It is what it is, and there’s nothing you can do to make your coffee hotter. Well, that’s an oversimplification, because you can pre-warm your cup by filling it with water and popping it into the microwave for a few minutes. However, that’s a fairly cumbersome workaround to have to go through for each cup of coffee after you’ve just spent more than a thousand bucks on a fancy machine. Note that not everyone will have an issue with the default temperature. It’s not bad, and a bit hotter than most other espresso maker’s “normal” temperature setting. But it’s not going to be for everyone, and it’s something you should be aware of before pulling out your wallet. There’s not a lot to say about this feature, so we’ll simply note that it has dual telescoping coffee spouts that can accommodate cups up to 5.5” in height. There are some machines on the market that offer a bit more on this front, accommodating cups up to 6” in height, but this is a solid implementation, by any measure. These two things are the heart and soul of any espresso machine, and here, the A9 wins high marks. There’s not a lot to say about the brew unit, so we’ll start there, and simply say that the brew unit is non-removable. This means you’ll need to pop a cleansing tab into the bypass doser and give it a thorough cleaning about once a week. As to the A9’s control system, it’s a technological marvel, the centerpiece of which is the TFT (Thin Film Transistor) touch screen, located on the top of the unit. 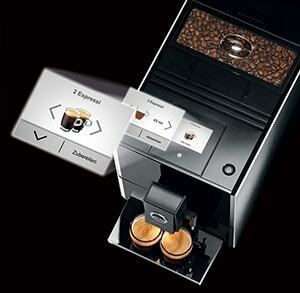 This represents a bit of a departure because most espresso machines mount their display screens on the front panel. On the whole, it’s a good idea, although, in order to see it clearly, you’ve got to be standing directly over it. Nonetheless, the organization of the menus the display panel allows you access to are very well designed and easy to navigate. These last two are drink recipes we haven’t seen on other models, both of which feature a feather-like foam finish we found to be quite enjoyable. 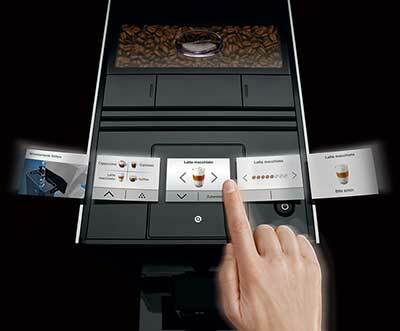 In addition to making your drink selections, you can reset the machine to factory defaults, change the system language, and make at least some adjustments to the pre-programmed coffee recipes, adjusting milk volume and dosing strength, which is a measure of how many beans get ground to make your coffee. Note again though, that one thing you can’t adjust here is the brewing temperature. The boiler only has one default setting. Another thing the control system doesn’t allow you to do is, you can’t set an auto-start time, or change the default auto-shutoff time. The A9 is designed to enter power saving mode after five minutes of activity, and will automatically turn itself off after two hours of non-use. Before we talk about the A9’s pump, we need to say a few words about how making espresso differs from making drip-brew coffee. If you already know this, just skip to the next section. If you’re new to this world, read on! You probably enjoyed a cup of drip-brew coffee this morning. Before that coffee found its way into your cup, it was conveyed from the grounds chamber to the pot below by simple gravity. Espresso machines don’t rely on gravity, they use pressure instead, and pressure is measured in bars, where one bar is equal to atmospheric pressure at sea level. It takes a minimum of nine bars of pressure to make a great espresso, and the A9’s pump is rated at fifteen bars. What that means for you is simply that every time you turn your machine on, it’ll be ready, willing, and able to create a world-class espresso shot, every time. 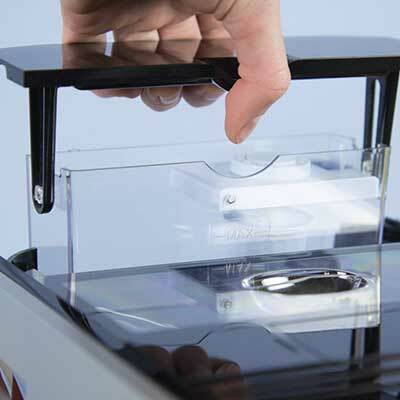 This is another important part of our Jura A9 One Touch review. There are two basic milk frothing implementations. A frothing wand and an auto-frothing system. The frothing wand is something that’s appreciated by coffee purists because it gives them fine-grained control over the milk temperature, and both the quantity and quality of the froth produced. Unfortunately, it’s also fairly intimidating to novice users, and for this reason, the A9’s designers opted for the auto-frother system. 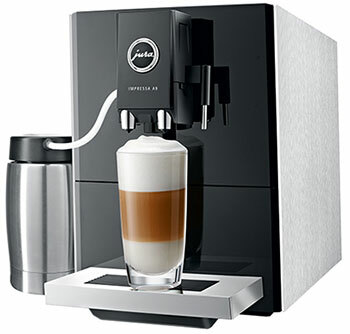 To use it, you simply run a small plastic hose from a milk container (Jura sells a dedicated, refrigerated stainless steel carafe, but honestly, most any container will work), plug the other end into the machine, just behind the coffee spouts, and order a milk-based drink. The machine does the rest. While you can exert some control over the quality and quantity of milk foam created via the control panel, that control is quite limited, although, in fairness, we were quite pleased with the foam the auto-frother produced for us. We like the A9’s milk frothing implementation very much, and we think that the bulk of the market will appreciate it too. 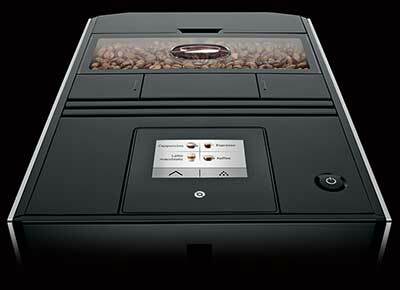 This will be a short section in our Jura A9 review because sadly, the coffee machine doesn’t have a cup warming tray. This is a fairly big deal because there’s no way you can increase the brewing temperature of the boiler. A cup-warming tray would be a great addition to the model, but here, it runs afoul of its small footprint. There’s just nowhere to put it, which means you’re left having to pre-warm your cup by filling it with water and popping it into the microwave. In our view, those two things (no way to adjust brew temp, coupled with no cup warming tray), create a really big problem for the A9. It won't be a deal breaker for everyone, but it will definitely turn some users off. You can also run rinse cycles via the control panel, and none of these are difficult to perform. In a similar vein, using the machine is a lesson in simplicity. How long did it take you to master the basic functionality of your smartphone? Whatever amount of time that was, cut it by about 75%, and you’ll have a good idea of how quickly you’ll be able to master the A9’s core functionality. It’s a very well-designed system, and Jura deserves high praise for it. While there is a lot to like about the Jura A9 Impressa, there were also several things that rubbed us the wrong way. In terms of pros, we loved its simplicity and convenience. Getting a world-class specialty coffee drink and replicating the coffee shop experience at home has never been easier. For some people, they might be, so you’ll want to think very carefully about what you want from whatever super automatic espresso machine you buy before settling on this one in particular. And that concludes our Jura A9 review. On the whole, we liked the machine. It’s very good at what it does, but it is narrowly targeted. If you drink a lot of coffee or are a part of a large household with multiple coffee drinkers, this machine will be entirely too small to serve your needs well. If you value fine-grained control over the drink-making process, then you’re going to want a machine with more grind settings, a frothing wand, and some way to adjust the brewing temperature. For those people, we highly recommend it. For everyone else, some other model will serve your needs better. Jura USA. Official Brand Website. The History of Coffee. National Coffee Association of U.S.A.
Coffee and Your Health. WebMD. Is Coffee Bad for Your Bones? The New York Times.